I am a Ph.D. student at the Ming Hsieh Electrical Engineering department of University of Southern California under supervision of Prof. Massoud Pedram. I have received my B.Sc. in Electrical Engineering from University of Tehran in 2013. Amir Erfan Eshratifar, Mohammad Saeed Abrishami, David Eigen and Massoud Pedram, "A Meta-Learning Approach for Custom Model Training", AAAI 2019. 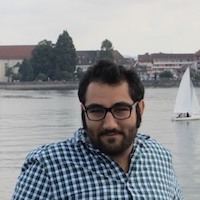 Amir Erfan Eshratifar, Mohammad Saeed Abrishami and Massoud Pedram, "JointDNN: an efficient training and inference engine for intelligent mobile cloud computing services", https://arxiv.org/abs/1801.08618. M. Saeed Abrishami, Luciano Nocera, Melissa Mert, Ivan A. Trujillo-Priego, Sanjay Purushotham, Cyrus Shahabi and Beth A. Smith , "Identification of Developmental Delay in Infants using Wearable Sensors: Full-Day Leg Movement Statistical Feature Analysis", IEEE Journal of Translational Engineering in Health and Medicine 2018. M. Saeed Abrishami, Alireza Shafaei, Yanzhi Wang, Masoud Pedram, "Optimal Choice of FinFET Devices for Energy Minimization in Deeply Scaled Technologies", 16th International Symposium on Quality Electronic Design (ISQED 2015). Farzad Farshchi, M. Saeed Abrishami, Sied Mehdi Fakhraie, "New Approximate Mul- tiplier for Low Power Digital Signal Processing", 17th CSI International Symposium on Computer Architecture and Digital Systems (CADS2013) . Amin Morad Hasel, M. Saeed Abrishami, Sied Mehdi Fakhraie, Babak Najjar Arabi, "Hardware Implementation of Video Filter Using Spatial Masks", 18th National CSI Computer Conference (CSICC2013) .